Market change is coming: Exactly when, where or how it will happen is unclear, but a growing number of asset owners and money managers are repositioning their portfolios to ride out whatever comes next. Market pundits, chief investment officers and portfolio strategists interviewed by Pensions & Investments said odds are against a major U.S. or global recession occurring in the next 12 months. But they broadly agreed that the eight-year equity bull market and the 30-year fixed-income bull market are at late stages in their cycles and vulnerable to disruption. In response, money managers and asset owners are diversifying their portfolios, allocating more to illiquid strategies to capture returns ​ uncorrelated to public markets and increasing liquidity — especially cash — as a cushion and a source of dry powder to take advantage of dislocations. The investment team at BlackRock (BLK) Inc. (BLK), for example, doesn't see a recession or major market decline "around the corner" but has reduced the spread risk in its portfolios because fixed-income valuations are very high, said Rick Rieder, managing director, global CIO for fixed income and co-head of the New York-based firm's $1.7 trillion global fixed-income platform. But "if valuations come down, we will go right back in," Mr. Rieder said, noting that the firm's portfolios increased cash holdings to do so if needed. BlackRock also has reallocated assets to sectors of the high-yield market where valuations are more reasonable, such as non-agency mortgages and increased weightings to emerging markets debt, Mr. Rieder said. Higher interest rates and inflation, secular economic growth and global geopolitical issues all are on the minds of investors, but sources pointed to impending quantitative tapering by central banks and its impact on high valuations across nearly all asset classes as the biggest source of concern. "The key is how central banks manage the end of the (quantitative easing) process," said Deb Clarke, the Chicago-based global head of investment research at Mercer Investments. Ms. Clarke stressed that the accommodative monetary policies of central banks after the financial crisis were an experiment for global markets as is the coming tapering, noting that "we've never seen anything like this." Mercer manages $191 billion in manager-of-managers strategies. Global reaction to the early stages of central bank tapering is cause for concern, given that the tightening cycle already is off to an atypical start, observers said. The U.S. Federal Reserve Bank is the first central bank to begin scaling back monetary intervention by reducing its balance sheet, but "the market is acting like we are at the end of a tightening cycle, not the beginning," said Charles Van Fleet, assistant treasurer and CIO of the $6.9 billion defined benefit plans and $3.5 billion defined contribution plans of Textron Inc., Providence, R.I., in an email. "At the beginning of tightening cycles, the yield curve should be rising and steepening, suggesting the Fed is slightly behind market sentiment of growth and inflation. However, the market is acting like we are at the end of the tightening cycle, where Fed is ahead of market sentiment (about) growth and inflation. The yield curve has remained fairly unchanged and (is) even flattening at the long end," Mr. Van Fleet said. But he cautioned that the "end-of-cycle tightening is where accidents happen with the Fed going too far, too fast." Facing growing market uncertainty, asset owners are turning to their consultants and money managers for portfolio advice. Consultants stressed that a highly diversified portfolio with a large allocation to illiquid investments that produces returns uncorrelated to public markets combined with a larger allocation to liquid securities and cash is the best defense against both short- and long-term market downdrafts. "Illiquid diversifiers such as royalties, life settlements, annuities and other investments that tend to do well in times of weak economic growth and continued exposure to more traditional alternatives like private equity and venture capital will be important in protecting investors' downside during difficult market periods," said Celia Dallas, chief investment strategist at investment consultant Cambridge Associates LLC, Boston. Mercer is hedging the downside risk of the portfolios it manages through higher allocations to systematic trend-following strategies; defensive tilts offered by hedge funds and investment-grade credit; and more cash, Ms. Clarke said. "The free lunch going forward will be diversification if stock and bond markets do sell off," she stressed. Institutional investors are addressing the issue of portfolio resilience and downside protection in numerous ways. In September 2016, the Rhode Island State Investment Commission, Providence, restructured the $8 billion portfolio of the Rhode Island Employees' Retirement System into three categories: growth, 55%; stability, 39%; and income, 6%. 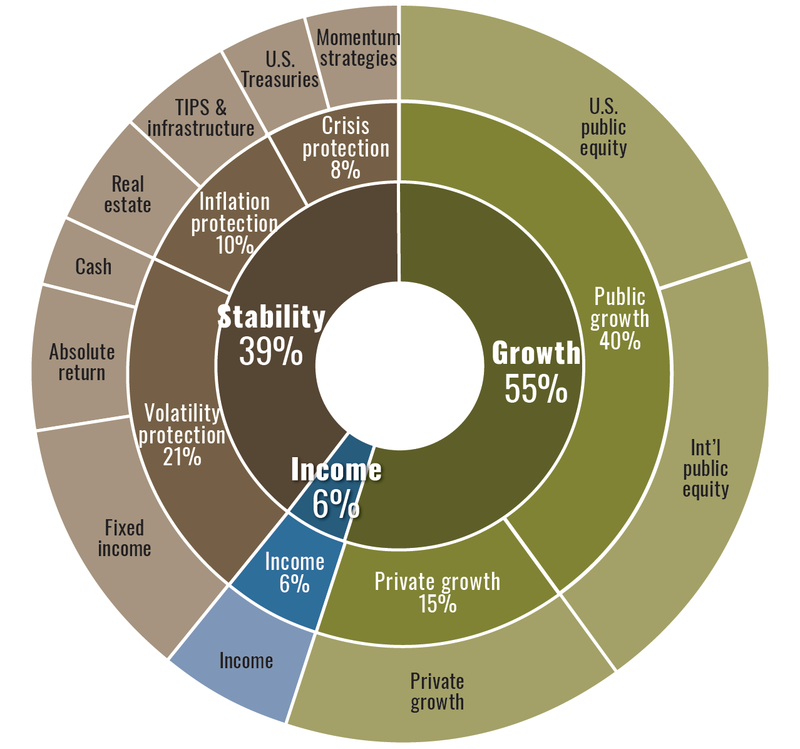 The stability portfolio is explicitly defensive, with 21% of the portfolio dedicated to volatility protection consisting of fixed income, hedge funds and cash; 10% of the portfolio is allocated to inflation protection through investment in real estate, infrastructure and Treasury inflation-protected securities; and 8% to dedicated crisis protection, which relies on long-duration U.S. Treasury bonds and systematic trend-following strategies. The combination of the three different strategies in the stability portfolio is designed to provide downside protection during periods of market crisis, said Evan England, a spokesman for Seth Magaziner, state general treasurer and chairman of the state retirement system. Investment staff very recently completed moving existing managers and hiring new ones for the new structure. The pension fund's custodian, Bank of New York Mellon (BK) Corp. (BK), still is putting final touches on a new reporting system that will provide composite returns of the new portfolios, Mr. England said. The state's new investment framework keeps a majority of assets in traditional investments, but it adds a stability class to protect against risk and an income class to help meet obligations. Minnesota State Board of Investment, St. Paul, is just beginning its process of reconfiguring the $65 billion portfolio of the Minnesota Retirement System to "add more diversification and not give up return in doing so," said Mansco Perry III, executive director and CIO of the state board. The pension fund's portfolio now is composed of public equity, public bonds and private debt, but "there's a larger opportunity set we should be paying attention to," Mr. Perry said. The new structure, approved by the board's investment committee but awaiting full board approval, will consist of growth, income, real return, opportunistic, inflation protection and liquidity portfolios. Specific target allocations to each category will be set later this year. The new investment categories will allow MSBI investment staff to increase investments in private markets with a goal of reducing the illiquidity by investing in credit and other strategies with shorter lockups than those of private equity funds. For example, the board eliminated real estate from the portfolio about five years ago but could tap back into the asset class through investment in real estate credit approaches, Mr. Perry said. Minnesota investment officials also are considering the addition of a crisis risk offset portfolio, similar to what Hawaii ERS has implemented, at the suggestion of Pension Consulting Alliance LLC, the board's special projects investment consultant. "The reason for adding a CRO portfolio is specifically for downside protection, but we're only considering taking a toehold to see how it works," Mr. Perry said. But timing exactly when to move to a more defensive portfolio allocation is not easy, as the $331.6 billion California Public Employees' Retirement System, Sacramento, recently discovered. A "defensive" position that reduced the equity allocation by 5 percentage points to 48% of plan assets in the fiscal year ended June 30 played a key part in the pension fund's overall 11.2% rate of return, said Theodore Eliopoulos, CIO, during an Aug. 15 investment committee meeting (P&I, Aug. 15). But he acknowledged that dialing down the equity exposure in the fiscal year prevented returns from being even better. The pension fund's $150 billion public equity portfolio returned 19.1% in the year ended June 30. "Equity markets rewarded risk takers this year, not a more defensive strategy," he said, noting "it's fair to say we were early," in deciding to reduce the plan's equity exposure. Mr. Eliopoulos told the investment committee that it's "impossible to predict" when the equity run-up will stop.